Niall Currie will turn away from his tactical traditions in a bid to unlock Portadown’s magic formula. Currie’s reputation in the region has been built on progress and prizes with Annagh United and Loughgall. Past glory days often arrived off the back of a 4-4-2 formation established on the foundations of power and pace. However, Currie has spent his early days in front of the Shamrock Park chalkboard working on a system designed to maximise the talents of the current squad. “It comes down to the players and people who remember me from Annagh and Loughgall may be surprised to know that at Ards we rarely played 4-4-2 across the past season or so,” said Currie. “At Loughgall we had the players suited to that system but we had to learn lessons from my first season in senior football with Ards and so this campaign I changed the set-up to limit the space open between defence, midfield and attack. “For much of last season with Ards and the early part of this season I moved away from the standard 4-4-2. “Ultimately, it all has to be about getting the most out of the squad available and we do not have the players at present suitable for that 4-4-2 formation. “You could see last weekend at Cliftonville that the endeavour was there but we did not make the goalkeeper work enough or create enough chances in the final third. “That is down to more than just the strikers but I am learning more about the players with each training session and match. “Trevor Williamson knows this club inside and out so is a great source of information. “The key is to have as many players out on the pitch as possible confident in what we need from them and with the mental strength required for our difficult situation. Mark McAllister made his return to the side after a spell out of the senior squad under previous managers Pat McGibbon and Vinny Arkins due to internal disciplinary issues. “I was delighted to get 90 minutes out of Mark and you could certainly see elements of what he can bring to the side,” said Currie. “He will get that sharpness back over time and everyone must continue the hard work in training. 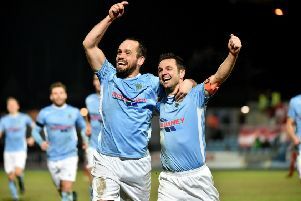 “Once Cliftonville went down to 10 men last weekend we had two strikers on with Aaron Haire and Mark, plus a winger but did not make the most of our possession. “In January I am hoping to bring in more pace and improve our attacking strength but, at the minute, it is about getting everything possible out of this squad. “That means finding a way that suits the current players and keeping confidence levels high by having the squad enjoy training as well as putting in the effort. “I do believe we can get this club back to the level it deserves but it is obviously going to take time.